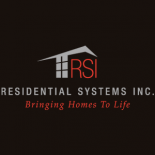 Residential Systems was founded in 1987 and employs 21 professionals. Travis Leo, CEO describes his experience in the CE industry and as a member of Azione Unlimited. Provide an exceptional customer experience at every interaction, listen to our clients, be responsive in everything we do, be a fun place to work and deliver exceptional value to shareholders. The networking opportunities, the chances to learn what others in the business are doing, the television pricing and the camaraderie that comes with a group like this.